We are delighted to announce the signing of a five-year deal with local taxi firm Penny Cars, who have bought the naming rights to the stadium. The Chapelhall based firm – the biggest in the area – this week agreed the deal to rename Excelsior as the Penny Cars Stadium, with the option to renew for a further five years. 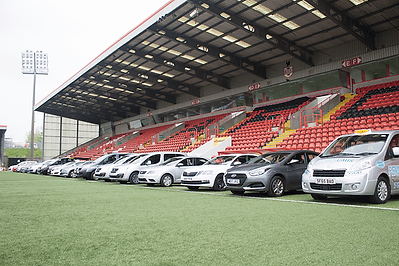 The deal will see all existing Excelsior signage at the stadium rebranded to Penny Cars, with further signage placed on the perimeter fencing at Craigneuk Road and Petersburn Road. Each entrance to the stadium will also feature an events board visible to all passing traffic and pedestrians, advertising all forthcoming matches and events at the stadium, while freephone taxis direct to the company’s head office will be fitted throughout the stadium. 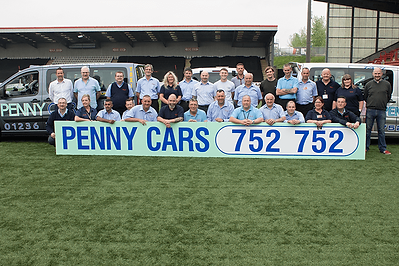 Bobby Watson, club chairman stated: “On behalf of the club and stadium, we are delighted that Penny Cars has become strategically involved in the process of rebuilding Airdrieonians Football Club. To enter into a long term partnership with such a successful local business is in keeping with our objective of bringing the businesses and people of the town together with a common goal of helping re-establish Airdrieonians once again not only as a force in Scottish football, but also a force for good locally. “The funding we receive from the stadium rebranding will help contribute towards a stronger team on the pitch, better facilities for our professionals, youth teams and amateurs. Penny Cars Manager Kenny Wade spoke to airdriefc.com and explained their decision to get involved. “We are the biggest taxi company in Airdrie and Coatbridge, and always looking for ways to increase our footprint in the community. “We have been aware for some time of the fantastic community work done by Airdrie and their fans in the last few years, from the Sensory Room to KitAid, and have also seen the boost that the new owners have given to the club since the turn of the year. We also have many Airdrie fans in our workforce, including ex-player and Assistant Manager John McVeigh. Commercial Manager Douglas Allsop added: “The deal has been something that we’ve been looking at on and off for a number of months, but when we finally sat round the table to talk about it, it was agreed within the hour. “They are one of the biggest companies in the town, with over 330 taxis, and everyone who is anyone knows of “Pennies”. There won’t be many people out there who don’t have their number saved in their mobile! “It’s another coup for the club and slowly but surely, we are managing to get the local business community involved with the club again, be it the small local shop taking out a programme advert, or one of the biggest employers in the town spending multiple thousands. “There will be many traditionalists – myself included – who yearn for the days of Broomfield, but the fact of the matter is football is moving on in terms of avenues for sponsorship and income, and we, like anyone else, must move with the times. The stadium is one of the best in the country, and is a massive selling point to attract both players and sponsors. It lets us command a bigger sponsorship figure than many other stadia in the country, ultimately leading to a better product on the park. To book a cab, phone 01236 752752, or download the Free App. Copyright © Penny Cars 2019 . All rights reserved. Sleeky Theme by StyledThemes.